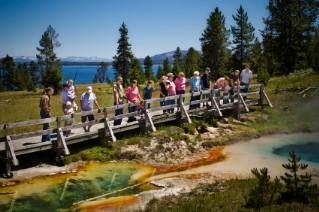 Theme family reunions around vacation spots in the U.S., such as Yellowstone National Park. A get-together with all the cousins, aunts, uncles, great-grandparents and newborn babies calls for a special family reunion theme. Though the event itself is often exciting in and of itself, having a particular theme can help planners coordinate activities to include everyone. Tracing the history of the family is a logical theme for a family reunion. Phrases like "genealogical journey" and "back to our roots" are perfect for expressing the theme in a party invitation. If people need to bring special items with them, such as materials for scrapbooking or crafting a family quilt, be sure to include this information in the invitation. Office supply stores can often print spiral-bound books for a low price, so that everyone gets a keepsake from the reunion. Large scrapbooks and quilts can be left at a family cabin or lake house; they can also be passed down from the oldest member of a generation to the next as the years pass. Get more information about family genealogy and reunion activities by visiting one of the top 10 free genealogy websites rated by LoveToKnow editors. Organizers can include a short family history write-up in the invitation or present one at the end of the reunion weekend. Just because it is a family reunion does not mean the theme has to be centered on the family itself. Plenty of other party themes are perfect for a reunion. Theme the family reunion party around a particular decade. For example, a back to the fifties party is fun for those who experienced it personally and those who have only heard about it. Another way to plan a decades past reunion is to have everyone come armed with clothing, movies and games that were popular in the year they were born. The family that plays together stays together, or so the saying goes. Get everyone active by planning traditional party games like three-legged races and obstacle courses. In the winter, head out to a local ice skating rink, ski resort or sledding hill. During the summer, plan a swimming excursion or participate in a 5k run or walkathon. Help others who are less fortunate during the family reunion. Volunteer with Habitat for Humanity, visit shut-ins or fundraise for an animal shelter. Vote on the charitable cause for the next year at the end of the reunion. Some years in a family may be significant. Theme a reunion around a baby boom, grandma's 90th birthday party or the numerous kids in the family graduating from high school and college. Because these occasions often call for a party in the first place, it saves time, money and supplies to plan a reunion at the same time. Celebrate annual reunions with a theme around the anniversary date. For example, the 10th annual reunion can have ten fun games for everyone and ten family recipes planned for the big family dinner. Commemorate the occasion by having a freelance photographer take photojournalistic style pictures of the reunion or pose everyone for a group portrait. What is the budget for the reunion? The amount everyone (or just the organizers) is willing to spend will determine whether the reunion is at a seaside hotel or if some backyard luau party ideas will be necessary. How many people usually attend? The number of people who attend the reunion determine whether an Olympic-sized obstacle course is needed or a simple playground relay race will suffice. How long is the reunion-a day, a weekend, an entire week? Plan elaborate themes that include excursions or projects for long reunions. Day-long family reunions can use one or two games and matching party supplies to pull off the theme. Does the theme include everyone in the family? If the only people who love the Disney movie High School Musical are the three teenage cousins, it probably is not the best theme idea for the entire family. Save it for their birthday party or another occasion more suitable. A family reunion theme offers an easy way for organizers to tie together various activities, projects, games and excursions. Memorable themes will keep everyone talking long after they have packed their bags for home.